Battery life is great and the chip is fast, but a pro device shouldn't have so many compromises. The Huawei Mate 10 Pro stretches the limits of what justifies the word “pro” in a product name, even in the hype-driven tech world. It might look more impressive than the regular Mate 10, which sports a front-facing fingerprint scanner, but both models have the same chip and camera components. The Mate 10 Pro actually has a lower-resolution screen, and Huawei has abandoned the headphone jack and microSD storage slot that remain on the cheaper model. But even with an identity crisis, the Mate 10 Pro is the kind of flagship phone you’d expect from Samsung and Google: packed with premium features, and oozing with power and performance. 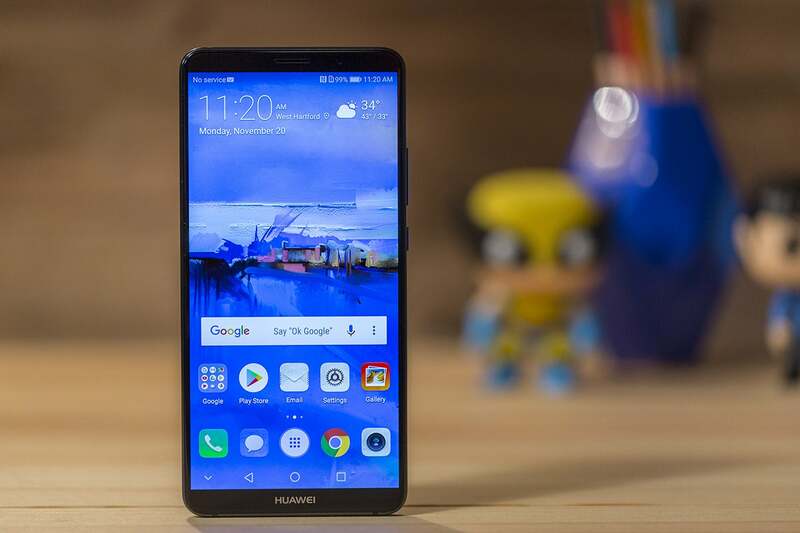 While it will no doubt struggle to compete with the likes of the Galaxy Note 8 and Google Pixel 2 XL once it releases in the U.S. (mainly due to a lack of carrier support), Huawei has nonetheless proven that it’s worthy of its No. 2 position on the smartphone charts. The Mate 10 Pro flips Huawei's flagship feature strategy compared to the Mate 9 Pro—for better or worse. 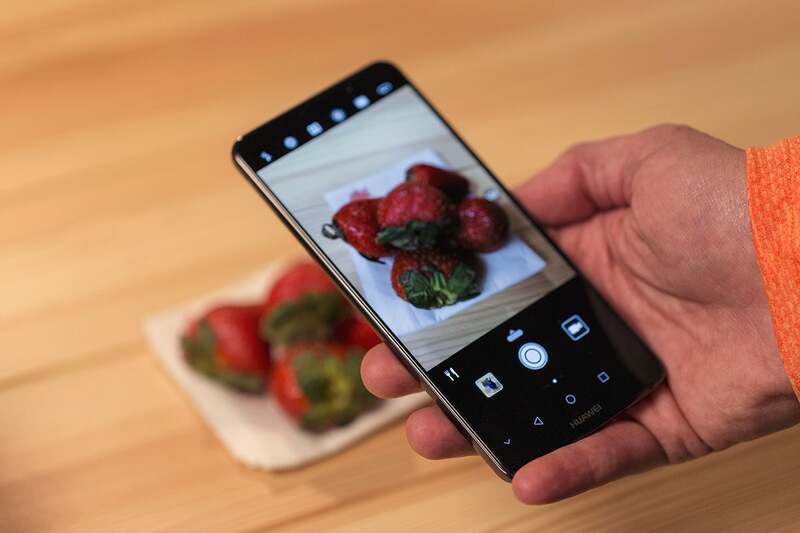 Where last year’s top-of-the-line phone was the one with the front-facing fingerprint sensor, for instance, Huawei relegates that to the non-pro model this year. Following the lead of other high-end competition, the fingerprint sensor's new location is on the Mate 10 Pro's backplate. The back of the Mate 10 Pro is made of glass, but it still doesn’t support wireless charging. The Mate 10 Pro also echoes its peers in the wide curves of its corners, much like the Pixel 2 XL's. The only real identifying marker is the reflective Huawei name on the chin (which I could do without). At 7.9mm, the Mate 10 Pro is a touch thinner than the 8.2mm Mate 10, but the slimness comes at a price: The Mate 10 Pro doesn’t have a headphone jack (though it does include a USB-C adapter and USB-C earphones in the box). Huawei blames that on its desire to have IP67 water resistance, but that argument doesn’t really float, since it’s not an either-or proposition on Galaxy phones. The Mate 10 Pro has a few other compromises. It doesn’t offer expandable storage, though the feature is available on the regular Mate 10. Also, despite moving from aluminum to glass for the backplate, there’s still no support for wireless charging. The Mate 10 Pro's display should be its crowning glory, but it's not. Huawei has brought back the OLED screen from last year’s Mate Pro, but in a curious move, it’s decreased the resolution. While the Mate 9 Pro had a best-in-class 1440×2560 Quad HD display with a 534ppi density, the 18:9 Mate 10 Pro only packs a 6-inch Full HD 1080x2160 screen with a 402ppi density. Confusingly, the regular Mate 10’s 5.9-inch, 16:9 LCD actually has a higher 1440x2560 resolution. Huawei’s Mate 10 Pro has a fine display, but it has a lower-resolution than its peers. That being said, the Mate 10 Pro’s screen has its charms. It has a vivid setting (like the Pixel 2 XL), but flipping the toggle creates a much more noticeable difference on the Mate 10 Pro, with vibrant reds and greens, and extraordinarily deep blacks. Colors are more realistic in normal mode, but they’re still bold and lively. If I didn’t know the Mate 10 Pro had a 1080p screen instead of a 1440p one, I probably wouldn’t have suspected anything was amiss. Still, it’s upsetting that a high-end phone would have a measurably lesser screen than an entry-level one, even if it is OLED vs. LCD. Huawei seems to be defining pro by screen ratio rather than resolution, and it’s giving users a tricky choice in the process: more pixels or more height. Once again, Huawei has made its own silicon for the flagship Mate phone, forgoing the popular Snapdragon 835 chip. Like Apple and its A series chips, this serves the Mate 10 Pro well—it's easily the fastest Android phone I’ve ever used. What the Mate 10 Pro lacks in ports, it makes up for in speed. Surely the speediness of app switching was helped by the 6GB of RAM in my test unit (a 4GB version is also available), but even in raw speed tests, the Mate 10 Pro's Kirin 970 professor performed at least as well as the Note 8 and Pixel 2 XL, both of which showcase Qualcomm’s latest chip. Huawei says the real performance benefits of the chip can be seen in the dedicated neural network processing unit, a unique AI-powered architecture dedicated to boosting the productivity and efficiency of your phone. While you won’t see it working most of the time, Huawei says the NPU offers 25 times the performance and 50 times the energy efficiency when compared to a “dumb” version of the same chip. It also says the Mate 10 will stay speedy over time, as the NPU keeps OxygenOS from getting bogged down. Obviously I wasn’t able to test these claims, but after witnessing the NPU in action in other areas, I have no reason to doubt them. Like last year, Huawei has fitted the Mate 10 Pro with a massive 4,000mAh battery, and thanks to the Kirin 970’s power management capabilities, it lasts even longer this year. Furthermore, the bundled SuperCharge charger fills up about half the battery in a half-hour. Huawei’s Mate 10 sips battery juice in standby mode, even when the always-on display is active. In straight benchmarks, the Mate 10 Pro powers past every Android phone I’ve tested, lasting for an impressive 9 hours and 18 minutes. For those keeping score, that’s better than last year’s Mate and the Galaxy S8+, the previous benchmark leaders. But while the Mate 10 powers through a day and then some, it’s actually more impressive when you’re not using it. Standby life isn’t something I usually test when reviewing a new phone, but the Mate 10’s is too good to ignore. With the always-on display turned on, I lost an average of 1 to 1.5 percent per hour of downtime versus an average of 2 percent for other Snapdragon 835 phones. When I turned off the always-on display (or used the super-handy scheduling function), I barely noticed any battery loss at all. In fact, over a 12-hour period, the Mate 10 Pro lost just 3 percent in total, meaning it could conceivably sit in a bag for a couple of weeks without needing a charge. The battery seemed to get even better as time went on. While I lost around 11 percent of my battery over the course of my first nights without plugging in, two nights later I lost just 7 percent over the same six-and-a-half-hour time period. That’s the NPU’s machine learning in action, Huawei says, and it’s hard to argue with the results. The companion chip is able to dial back background processes when the phone isn’t in use, making it last even longer than the benchmarks say: I routinely had between 30 and 40 percent at the end of a normal day of use with my Mate 10 Pro, measurably better than the Note 8 and the Pixel 2 XL's performance under similar circumstances. Flip over the Mate 10 Pro and you'll find a vertically mounted, Leica-branded dual camera setup with a dignified reflective stripe. Both Mate 10s have the same camera, and its specs are in line with what you’d expect from a premium phone. The dual system pairs a 20MP monochrome lens with a 12MP RGB one, and both have f/1.6 aperture, the best you’ll find in a smartphone. There’s also optical image stabilization in the main lens, dual LED flash, and phase detection autofocus. The Huawei Mate 10 has a Leica-branded camera, but it’s still not clear what kind of benefits that brings. The camera is once again Leica-branded, but it's hard to quantify exactly what that brings to the table other than a familiar name. In my testing, I found the Google Pixel 2 performed slightly better overall. In adequate light, its photos were virtually indistinguishable from the Pixel 2's and Galaxy Note 8's. The OIS and aperture kept low-light pictures looking decent, too. However, in harsh light it took an extra second or two to focus, causing it to miss details that the other cameras caught. Overall, however, the Mate 10 Pro offers a fantastic camera phone, one that’s easily on a par with Android’s bests. In harsh low light, the Mate 10’s f/1.6 aperture (left) was no match for the superior processing power of the Note 8 (center) and Pixel 2 XL (right). The Mate 10 Pro (left) was able to understand this unconventional portrait better than the Note 8 (center) and Pixel 2 XL (right), and it performed well with actual faces, too. Like the Pixel phones, a lot of the Mate 10’s picture-taking abilities have nothing to do with the actual hardware, but rather the heavy lifting done behind the scenes thanks to the NPU. 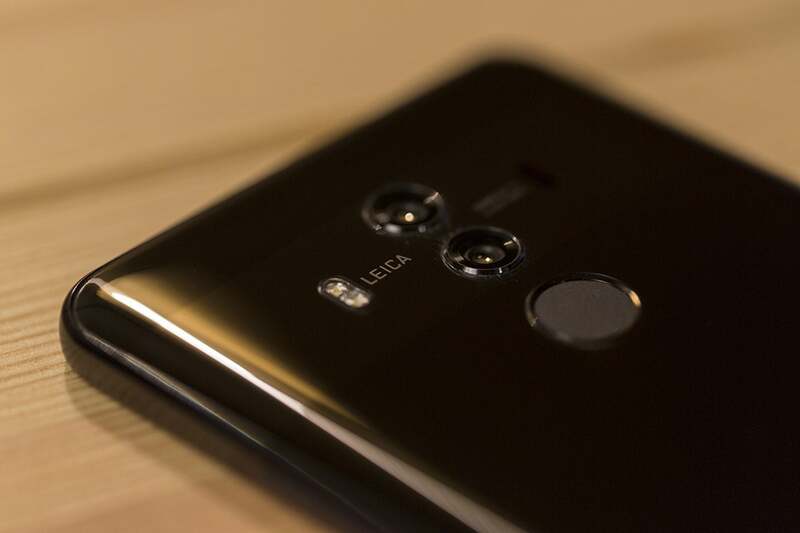 Most notably, Huawei has 13 shooting modes that trigger automatically when the camera detects something it recognizes, such as a face or a flower. When the camera sees food, it switches modes, as evidenced by the fork-and-knife icon. The shooting modes are my favorite feature of the Mate 10 Pro. I loathe most camera apps’ settings and menu screens, and on the Mate 10, I barely had to visit them. Even accessing the pro controls is easy, via a simple swipe upward above the shutter. It’s a close call between the Mate 10 Pro and the LG V30 as to my favorite camera app, but ease of use definitely goes to the Mate 10 Pro. Huawei has jumped its EMUI OS from version 5.0 to version 8.0 for no other reason than to brag that it’s one of the first phones to ship with Android Oreo out of the box. It’s a nice surprise, as many newer handsets haven’t yet made the leap, but it’s not nearly as big a deal as Huawei—or the three skipped version numbers—would have you believe. 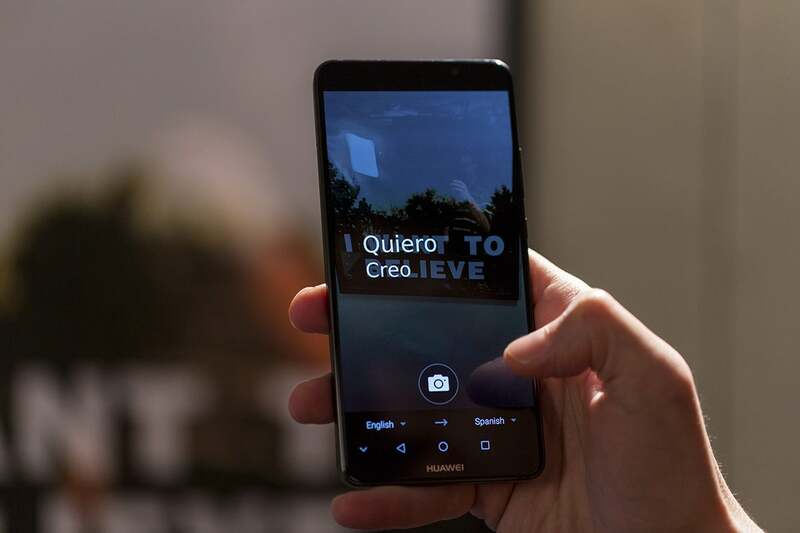 The bundled Microsoft Translator app uses the Mate 10 Pro’s NPU to deliver speedy, accurate translations. The biggest change (in addition to the regular Oreo features such as picture-in-picture and notification dots) is the addition of a navigation dock. Instead of the static navigation keys at the bottom of the screen, you can opt to overlay a circle on the screen to go home, back, and see recent apps. It's one of those features that's different rather than better than the stock solution, and I turned it off pretty quickly. A specialized version of Microsoft’s Translator app works with the NPU to deliver speedy translations. In my testing, it worked very well, and it’s good that Huawei didn’t set out to build its own (possibly inferior) version. Other than that, EMUI 8 is pretty similar to EMUI 5. The overly skeuomorphic icons remain, but you can tweak the appearance somewhat via the theme store. It still has the best lock screen in the business, courtesy of a rotating library of images and a small pedometer above the time. I love the double-knock gesture that simplifies the screenshot gesture, though I found myself getting it mixed up with the common double-tap-to-wake gesture (which EMUI doesn't have). Should you buy a Mate 10 Pro? Slapping a pro moniker on a phone generally implies that it’s the best version of that particular model, but that’s not exactly the case with the Mate 10 Pro. Compared to the cheaper Mate 10, it has a lower-resolution screen, no headphone jack, and no expandable storage. The only real benefits come in the form of a sleeker design and OLED screen. Huawei won’t let you forget you’re using a Huawei phone. For most people that probably won’t be worth the $100 premium Huawei is charging internationally for the 64GB Mate 10 Pro. It might be a moot point in the U.S. anyway, since we don’t know yet whether the Mate 10 Pro is actually releasing stateside. But if you don’t mind the home button, the non-pro Mate 10 is clearly the better deal here. It has the same chip, camera, and battery, and you get a headphone jack. And the screen is just 0.1 inches smaller. That’s not to say you shouldn’t buy the Mate 10 Pro. If you don’t mind the display deficiencies, it’s one of the best handsets of the year, with tremendous battery life, incredible speed, and good looks. I just wish the delineation between the models were a little more straightforward. I personally don’t like home buttons, but $100 is a lot to pay to get rid of it. And the technical knowledge that you’re buying a lower-res screen is probably a non-starter for some people. Going pro shouldn’t be about sacrifices, and with the Mate 10 Pro, you might feel like you’ve made too many of them. The Mate 10 Pro is a fantastic phone, as long as you can overlook its non-pro parts. Incredible fast chip with a built-in neural processing unit. Battery life is the best I've seen on an Android phone. EMUI 8.0 makes the leap to Android Oreo before other phones. 1080p display has a lower resolution than last year's Mate Pro. No headphone jack or expandable storage.